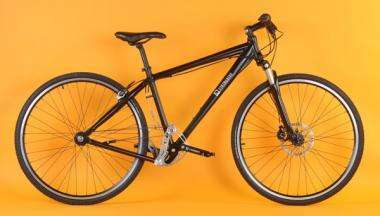 (PhysOrg.com) -- Hungarian bicycle designers have unveiled their new Stringbike in Padova, Italy. The design replaces the traditional chain with a symmetrical rope and pulley system, which they say is more efficient, makes for a more comfortable ride, and provides improved maneuverability around winding streets. The new system is more complex than a chain and gears and consists of a rope and pulley on each side of the bike. The rotation of the pedals forces arms at each side to swing forward and backward on its shaft. When moving forward, the arm pulls the driving wire that is wound around a drum on the rear wheel, forcing the wheel to rotate. The arms at each side alternate so that when one is moving forward the other is moving backward. The drive system will be able to be replaced with different size parts and different shaped eccentric discs for specialized purposes such as racing or touring. The rear wheel can be removed in only a few seconds without affecting the drive system. The driving rope is a special high density polyethylene (HDPE) product with high stability over extended periods, and which is resistant to mud, water, dirt, sand, and humidity. The traditional bicycle has a chain and gears on one side, which the designers from bicycle manufacturer Schwinn Csepel Zrt say has led to a lot of problems, although they do not say exactly what those problems are. They say most are unnoticeable problems until you’ve actually ridden a symmetrical system. One problem that the new design does remove is soiling clothes with the grease or oil on the chain, since the pulley system is dry. Another advantage of the system is that the ropes can be attached in different positions on the two sides of the bicycle, which means it can compensate if one of the rider’s legs is weaker than the other. The designers also say the lifetime of components will be longer than for conventional bicycles because chains are more susceptible to wear and abrasion, and the number of components is reduced. How do you control a bicycle? I would love to try one, though it still basically looks like a chain to me. Looks like a flawed design. They need to throw a bucket of simulated road grime (oil+dirt+water) on it. This would cause unwanted slipage of the string against the drive pulley on the rear axel. Traditional chain+sprocket cannot slip by design. Perhaps the drive train could be sealed to prevent contamination. Nice design but calling it an improvement is a mistake. Can you say rope saw? Granted, Leonardo da Vinci was undeniably ahead of his time. However, it has been over five hundred years since he invented the modern bicycle's chain and gear "pulley" system. It's about time for a change. Interesting design but it looks like more of a contraption. The crank drives a cam which must be greased contrary to what they say. There is another pulley sytem hidden away that changes the gear ratio. You can see it if you blow up the picture and look carefully. Actually there are two of them, one on each side. this looks really flimsy. Also, the rear hub is actually a rachet. the rope pulls on this ratchet to drive the wheel forward, then at the end of the stroke it rachets backwards really fast. You can see this if you look very carefully at one of the videos. Having some experience in this area, I too was sceptical at first. But after studying the mechanism, I can say that the design seems sound. They also claimed to have driven 10,000km with it (albeit in a test bench, with presumably no dirt). I am confident that after a week, nobody here would switch back to their own bike. Advantages like non-linear stroke, less restrictions on shifting, automatic idle positioning of pedals, being maintenance free, lack of grease all over, and some others, are really hard to describe convincingly in today's lie-and-hype world. Oh, and the difference in efficiency (energy wasted within the drive system), especially compared to in-hub gears, should be easily noticeable. I'm sad this wasn't invented in my country. The efficiency of a chain drive is easily 95%+ and around 80% if you can't really be bothered to clean it. I don't think there's a noticeable difference. Honda used this stroke and rachet drum system on a little scooter thing decades ago, albeit without the variable stroke, which is the real invention here. It will work, in the real world. IBM used a similar system for carriage returns on big typewriters for years, may still do so. There's only a tiny loss in the rachet, none in the wrap-around. There's considerable loss in the chain drive, especially at high drive ratios like top gear, with high stress on small teeth, which mesh imperfectly and slide and wear, especially when sand is in the necessary lubricant. Suggest folks who have doubts go to the company's web site and research farther. This seems an excellent product to me and I'm looking forward to purchasing one to try it out. Go to their website and read. Yes, the pulleys are ratchets and there is a third ratchet that you haven't "discovered". There is a lot which you don't understand that the website explains. It is nice to have the facts before critisizing. ...but you are all forgetting to ask the most important question. Does it double up as floss? Just think of the possibilities! One minute you`re kicking a$$ in la Tour de France and the very next you`re fighting the very evil Dr. Cavity Gingivitis, who is hell-bent on taking over not just your mouth, but the whole worlds`. This is awesome! The ability to change gears while stationary will definitely be useful in city riding. This is a great product, they finally truly reinvented the bicycle! I think it can only deliver power on downstroke. For me that makes this a no-go. If you havent tried clipping into your pedals yet, you should. You are only using like 2/3 or 3/4 of your potential if you dont pedal on the upstroke. Miles per calories stringbike might be as good or better than a non-clipped chain-drive... but in both certain valuable mucscles become baggage. So perhaps in a power-to-weight equation its ultimately less efficient than chaindrive with your feet connected. Pulleys seems a bit wide I guess they have to wind string around them? I agree with your comment about the importance of the power from the rising foot. At first I agreed it was a concern. But since the two pedals are linked the power of lifting the right foot just adds to the power of the left foot pushing down. Just like with chains and gears. I think the width of the pulleys may be a concern. Assuming the space between the dropouts is fairly standard. That width means the two hub flanges that the spokes connect to are not very far apart, That would mean the wheel would have less lateral strength. Maybe the whole symmetry thing is a foil. The idea could have worked with the drive on just one side, but maybe they needed 4 strings to transmit enough torque. That aside, it is a neat idea. My mistake. A drive on one side would be a pulsed drive. There would be no power while the spring allowed the string to return to home. The two sides were a necessity to get continuous power. Good sales engineering: call a necessity a feature. Looks like a flawed design. They need to throw a bucket of simulated road grime (oil+dirt+water) on it. This would cause unwanted slipage of the string against the drive pulley on the rear axel. You must take a better look at it. The "strings" are firmly attached to the hub. There can be no slippage. So exactly how does this handle riding in the rain, or even just going through a few mud puddles? I am curious to see how this type of drive works in a very off road environment. My point about the hub not having flages far enough apart was bogus. As can be seen in the "Internal Symmetry" pull down of their web page, the dropouts are VERY widely spaced. The hub is normal width. The wide dropouts and the "swingarm" pivot located below the bottom bracket say this needs a unique frame. Their symmetry is important and far reaching. There are two rope wheels, one each side of the bearing that rides on the "swingarm". Everything is balanced and there is no friction. This is a well thought out design. As has been said, the "strings can't slip. They are fastened at both ends. Force is applied by tension only, not friction like a belt. I think it is a great design, although there are a lot of parts. Fortunately the large number is through 2 copies of many parts and 4 copies of others. So there aren't that many unique parts. It will be interesting to see the cost. 1. what is the friction compared to a chain driven bicycle? I want numbers comparing the two please. 2. how much does it weigh compared to a similarly priced chain driven drive train. 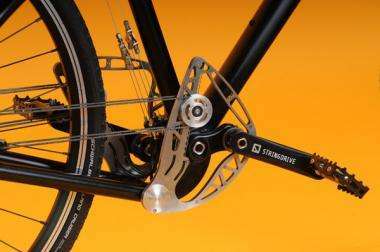 (stringbike.com states: The weight of STRINGDRIVE® is comparable with the weight of a chain drive with high shifting range or with a simple chain drive used together with a quality hub-gear) which means to me "we don't want to say because it weighs more". How about publishing the actual weight in grams please. Friction and weight are HUGE issues and the most efficient bicycles address these pretty darn well (at a price) This system needs to work with less friction, be lighter, and more reliable than a conventional chain driven drive train, and to be fair, it may actually be (although unlikely), but I'd like to see some tests, measurements, (and the data) after comparing the two side by side. Looks to me like the string may stay cleaner than the chain. After I ride on a sandy stretch of road I have to hose the bike down but that still leaves the chain full of sand and basically have to wash the chain in petrol to get the sand out. The string bike looks like there could be a problem with heavy sand load in the cam area only. A quick hose down should get the sand off the string. Perhaps the string bike is a better off road bike. If the hype is correct. I have been stranded with bent gears after picking up a branch while riding through a field. With the string bike perhaps I only have to untangle branch from the string.